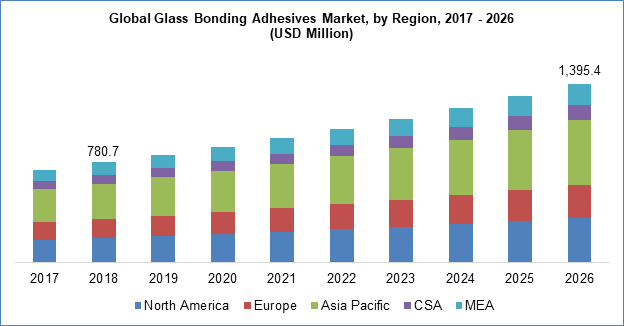 The global glass bonding adhesives market was estimated to be worth USD 780.7 million in 2018 and is anticipated to grow at a CAGR of 7.5% from 2019 to 2026. Market growth is owing to its demand from several end use industries. Significant development in precision dispensing technologies has be beneficial in creating novel applications for these products. Glass bonding applications for automotive OEMs, sunroof, tier one automotive applications have been the most promising ones. Bonding technology enables for new designs. Special light curing and UV acrylates for glass bonding are some of the new applications in the marketspace. Some of the classical applications include bathroom scales, glass furniture, design elements and shower enclosures. But the primary requirements to be fulfilled by these adhesives include perfect adhesion to glass, and permanent transparency of adhesives. These products surround us in nature in everyday life. Substantial business exist that develops, manufacturers, and markets these glass materials and these have found applications virtually in every industry and business. Applications abound from office to automotive design and safety glass to footwear to aerospace structures. Products such as polyurethane glass adhesive sealant are new in the market. These are on component fast curing adhesives that forms rigid yet elastic permanent bond. Some of the key features that has played a significant role in increasing use of these products include one component moisture curing, bond dissimilar materials, adheres to materials applied to vehicle window bonding, high strength, fast curing, higher modulus and hardness. These products are used in a variety of industries such as packaging, construction, automotive, furniture, textile, appliances, aircraft and several others. Several manufacturers supply different products to several end-use applications for a multitude of applications. Moreover, even if a number of companies dwindle owing to industry wide consolidations, the U.S. alone itself host around 1,500 companies that manufactures several categories of glass bonding adhesives. UV curable or visible light curable glass bonding are among the most demand products in the current market. These cure in the shortest of time upon exposure to light and forms high strength bonds to metals, plastic substrates and industrial gases. Glass bonding adhesives are used in a wide range of industries. But around 70% of product demand in terms of volume is from four to five major industries. And around 60% of overall revenue generation is from sales of these products to these particular industries which include automotive, aerospace, electronics etc. These are among the relatively small volume but high-priced product users. Advancements in bonding technology has opened up new opportunities for application of these products in building and construction sector. Development in this technology has brought up thermal insulation up to 20%, up to 30% more light, increase of approved wind load up to 10%, reduces the production cost up to 90% and most importantly up to 90% lesser complaint rate. Increasing use of facades in buildings is a primary factor driving demand for glass bonding adhesives simultaneously. Application of glass as reinforcing elements in windows has generated additional demands for these bonding materials. The Asia Pacific region accounted for the largest market share in 2017 i.e. around 33% of global demand. 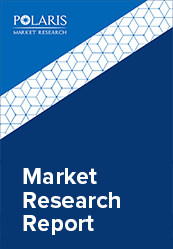 Th regional market is expected to grow at a CAGR of 3.4% from 2018 to 2026. China is the largest consumer in the region and is also the biggest producer. South Korea and Japan are more mature markets compared to China. Combining of one fifth of the region’s adhesives volume in 2017, these two nations were approximately one quarter of the value as they consume a larger share of higher price and performance products. India was estimated to consume around 19% of the regional volume demand in 2017. But its annual growth in demand for glass bonding adhesives is the highest in the region and it is expected to be the fastest growing markets in Asia Pacific over the forecast period. Th growing automotive market in the Asia Pacific region is one of the most potential end-use industries that are anticipated to generate significant demand in the near future. Emerging automotive manufacturing base in India, Australia, Indonesia and even Bangladesh have provided immense additional opportunities for further increase in demand for these products. Building and construction is the largest consumer of these products in Asia. India’s rapidly growing modern infrastructure and building markets, Indonesia, Singapore and other parts of Malaysia, Philippines, China’s ever-increasing building and construction industry and also Japan and North Korea’s markets are very lucrative for driving sales of glass bonding adhesives. European countries accounted for around 27% of the demand in 2017 in terms of revenue. Volume demand was up modestly from 2016 but still was down compared to 2015 by around 5%. Slow growth is expected to the Western European nations while modest increase was witnessed in Turkey, Russia, and Eastern Europe countries. North America also accounted for a significant market share in 2018. Similar to demand patterns in Europe, North America glass bonding adhesives demand is projected to grow at around 3.5% for the next few years, which is almost similar to that of Europe’s. South and Central America accounted for mere 7% of the overall global consumption of these products in 2017 – 2018. Brazil was the largest market and accounted for around 75% of regional consumption in 2017. Development of several end-use industries in the country is the major factor driving demand for these products. The glass bonding adhesives market is a diverse collection of several end-use industries, applications and suppliers that relies on numerous raw materials and even technologies to cope and survive in the frequently changing market dynamics. The leading ten adhesive suppliers in the world accounted for around one fifth of product sales in 2017. Several supplier’s argument their glass bonding adhesive business through sales of several other related products such as construction products, sealants, binders, tapes, potting and encapsulating compounds, coatings, etc. Some of the industry players that are among the leading ones in the present industry space include The DOW Chemical Company, The 3M Company, Henkel AG & Co. Kgaa, Sika AG, Kiwo, Dymax Corporation, H.B. Fuller, Bohle Group, Dymax Corporation, Threebond Holdings Co., Ltd., Bohle Group and Permabond Engineering Adhesives Ltd.